Cambodia bicycle tours: cycling and biking in Angkor, Siem Reap. There are few biking experiences that compare with cycling beneath towering fig trees among a thousand years of Khmer history at Angkor. Let our trusted Cambodian cycle and temple guides give you an interesting and a totally different way to visit Angkor. The added benefit of being on bicycle is that you will see more than the incredible legacy of the Khmer empire and get to glimpse into rural Cambodian life. We loved our tour with Mr. Vibol. He showed us along many backroads and communities we would never have experienced without him. Great introduction to Cambodian culture and history. We'll be back! A highlight for us was approaching the ruins through the jungle / bush. Touring on bikes is a fantastic way to get off the main roads and really get a feel of the country, landscape, people and see their way of life. Excellent tour - we saw and learned far more than if we would have gone off on our own! We ride as a group, with experienced SpiceRoads cycle guides setting an even pace and stop often to visit points of interest and sample some of the local food. Our support vehicle follows close behind with plenty of refreshments. This trip has a specific Temple Guide who is extremely knowledgeable on the temple complex and can also explain the local area, history, customs and way-of-life each time we stop. For groups of less than four people you have a choice of a cycling guide or a temple guide in the support vehicle. This trip is suitable for all levels of riders and is an excellent trip for families. 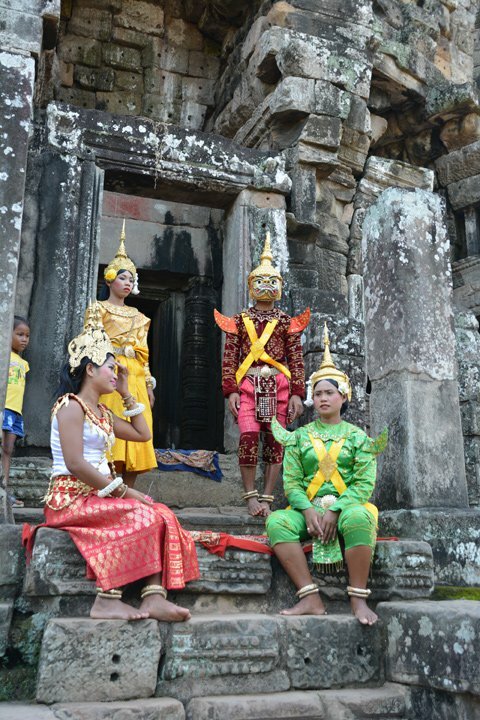 We do not include accommodation on this tour, but will pick you up from your hotel in Siem Reap each day.